After reading about Trump's proposed budget, it got me thinking about the sheer size and scale of the US military. Why do we need to spend more money on our military than the other top seven nations combined? Why do we have more military strength than the rest of the world combined? Where are we going to war, or is it more about funneling US taxpayer dollars to defense contractor to feed the Military War Complex President Eisenhower warned us about in 1961? “In the councils of government, we must guard against the acquisition of unwarranted influence, whether sought or unsought, by the military-industrial complex. The potential for the disastrous rise of misplaced power exists, and will persist. Needless to say, Trump's budget proposes to dismantle programs that support science, the arts, humanities, and safety programs that support our most vulnerable citizens. The following infographic from the New York Times highlights these cuts. The most disheartening aspect of all of this is just how corrupt our government is. This has been going on for the better part of the 20th and 21st centuries in the US, but now it seems the gap between the haves and the have nots is growing wider. This Princeton University study on how effective corporate lobbying is on which type of laws in the US are passed is rather sobering. Watch the six minute long video below to learn more. The United Nations Framework Convention on Climate Change released a plan to save the planet from catastrophic effects of climate change. Mission 2020 provides the plan for how to meet the goals set out by the Paris Climate Agreement of 2015. This report outlines how together humanity can work towards curbing green house gas emissions before the year 2020 to limit global temperature rise by 1.5 degrees celsius. The report highlights areas of focus that include energy, infrastructure, transport, land use, industry and finance. With advances in the renewable energy sector, and new technology being developed we have the know how and engineering prowess to address the main concerns of climate change, but lack the intestinal fortitude and political willpower to make the change. Maybe Mission 2020 will push us towards the goal of a sustainable future. Also, the godfather of climate science Michael Mann provided an excellent analysis in Time magazine. In the winter of 2015, youth from Boston Student Advisory Council (BSAC) and Youth on Board (YOB) were approached to give feedback on the new proposed state science standards. Due to the fact that the previous science standards did not do much to teach students about what happens when the oceans rise, or how an increase in fossil fuel emissions can affect the climate, or how and why seas warm and what affect that has on people, we felt that this was incredibly important to our education. Having recently taken up climate change as one of our campaigns and working with Boston Public Schools (BPS) on school-based initiatives like energy audits and power down Fridays, we emphasized the importance of climate change as an issue that directly affects us. We wanted science teachers to teach students things like renewable energy, sea level rise, and ocean acidification. During the summer of 2014, BSAC was invited to outline youth priorities for the city’s Climate Action Plan (CAP), and one of our main priorities was the education of BPS students on climate change and the implementation of real solutions. Additionally, we desired a mandate that the climate change curriculum be engaging, interactive, and relevant to young people’s lives and their communities. With the curriculum a priority for Boston’s CAP and the standards put in place shortly afterwards, it was the perfect time to create a standards-based curriculum on the science of climate change. Although there are new standards in place, the goal of the climate change curriculum is to help cement not only knowledge of what’s happening to our planet but the fact that we also have to teach the educators and students how this affects them. BPS is comprised predominantly of people of color and it is essential to inform the community about the social, economic, and racial implications of climate change. As such, in the summer of 2016, we partnered with the BPS Science Department and the Boston Teachers Union to create this curriculum. Our job? Provide teachers and curriculum developers feedback on the environmental and climate issues, like ocean science and coastal resiliency that we wanted to see in our schools. Since the curriculum was developed, the YOB Climate Team has been actively providing feedback in lessons plans regarding climate change, and seeking to implement the curriculum in science classes in grades K-12. We went through each individual lesson as a team, to ensure the sequencing and the units engage students as much as possible. Additionally we provided areas for further extensions of lessons and topics that could be worth exploring. Also, we incorporated into each lesson in the curriculum both local and global environmental justice connections, and meaningful, real world implications of the topics students will learn in their science classes. Boston Globe Article with information about the work. The implementation of new, climate-related state science standards provides a content guide and framework for teachers like those we worked with who seek to create lessons on climate science. Describe cycling of carbon through the ocean, atmosphere, soil, and biosphere and how increases in carbon dioxide concentrations due to human activity have resulted in atmospheric and climate changes. This is one of the new climate-related MA science standards, and was used to develop lessons such as a 11th and 12th grade lesson on sea level rise and carbon footprints. The lesson asks--how will sea level rise affect coastal communities into this century and beyond? How does your personal carbon footprint contribute to climate change? How does the average American compare to other global citizens? Things like this are talked about in the high school level but built upon lessons that would be taught in the elementary and middle school levels. Lessons like this are essential--especially in places like Boston, which is a coastal area under the threat of rising sea levels. How does it look that students don’t know what CO2 is? Or how if you ask students where they learned about climate change the responses are usually one or the other…--the first being they learned about it outside of school from an organization, event, teach-in, etc. or the second being that they have never learned about it at all? 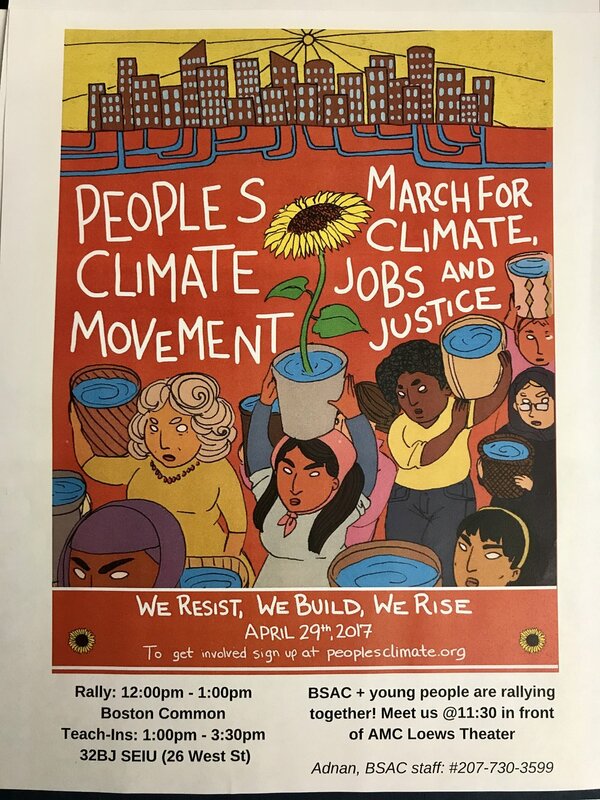 This spring, we have been organizing around the 2017’s People’s Climate Movement (PCM) in Boston, seeking to spread the word about climate and racial justice and bring public attention to the movement. We took our curriculum to the Boston PCM, leading a teach-in where we provided an overview of our lessons, K-12, to over 60 people who attended our workshop. The curriculum is garnering a large amount of interest from teachers both in and outside of the school district. As the curriculum continues to grow, we hope to continue providing student input and feedback to it, while spreading awareness and recruiting teachers to help pilot it. Our hope is eventually this curriculum is implemented by all science teachers in BPS and elsewhere, with the goal that every student has access to meaningful and engaging climate education. By Michael Jones, Rossy Santana, and Adnan Malek of the Youth on Board Climate Team. We spent the late morning and early afternoon engaging with the visitors on the Boston Common and YOB and BSAC students explained to the public the work we have put together around ensuring that all students have access to lessons on climate change in their science classes. One of the YOB members, Kathleen Alvarez gave an impassioned speech from the Gazebo in the Boston Commons in front of thousands of people highlighting the impact of student activism, and fighting for access to climate change curriculum. From 1:30pm to 2:45pm we hosted a climate change curriculum teach in, where we demonstrated to the public what our project offers, and how to engage with the material. We split up the attendees and taught the scope and framework of the lessons to each small group. The groups of visitors then rotated through all of the different divisions of the curriculum from elementary school, middle school and high school. The teach in was an amazing success where we were able to communicate our ideas, receive constructive feedback and make valuable connections within the community. Nicole Fleming, a reporter from The Boston Globe came to the workshops and even wrote about our event in the Sunday Globe. The article can be found here. Thousands rally on Boston Common to demand action on climate change. It was an amazing day to be around like minded people who care about the environment and implementing solutions to problems we will face with climate change. Additionally I was extremely impressed with the YOB and BSAC students, and their ability to effectively communicate their ideas about the climate change curriculum to the public. Trump's budget is especially concerning when his plans call for gutting the very few regulations that keep industry from completely eviscerating the environment we live in. The link between consistent organic pollutants, heavy metals, pesticides or environmental toxins and human health is well known. Unfortunately with current constructs of American society, industry is not held accountable for remediating all of the pollution that is constantly dumped in society and amongst us. So due to socioeconomic structure, the poorer citizens in society bear the brunt of these environmental toxins. Proximity to highways is shown to cause elevated levels of asthma in children, or the criminal activity that caused the Flint Water Crisis, the theme is always the same. Less regulation and more profit for industry, while the rest of us suffer, but predominantly the poor. Sidney Fussel from Gizmodo provides an excellent writeup on how Trumps policies on the environment and climate will disproportionately affect the poor and people of color. Yesterday's Congressional Hearing on Climate Change was an absolute and complete embarrassment. To quote Representative Bill Foster, "This is a very strange mixture of science and... not." Without a doubt the strangest moment came when Roger Pielke Republican witness stated "Scientific uncertainty is not going to be eliminated on this topic before we have to act." The mental gymnastics these people must go through to defy logic must be exhausting. I only wish the Republicans were honest enough to admit that the only reason they are questioning climate change is the money they get from the fossil fuel industry. If you want to watch the two plus hours of mind numbing insanity, the video is below. Grab your popcorn. On a more positive note, you can get involved and make a difference. You can let your voice be heard, your presence felt, and let those in power who deny climate change is an anthropogenic phenomenon feel your presence. Join the March for Science in your local area, and stand with other concerned citizens who stand for science, logic, and building a better and more sustainable future. This is one of the more effective uses of your time this year on Earth Day. So be sure to participate, and spread the word about Marching for Science this April 22nd. Search the website for locations close to you to get involved. With news breaking today that Exxon Mobil has written a letter to President Trump urging him to stay in the Paris Climate agreement, it really highlights the absurdity of his plan to roll back the Clean Power Plan that President Obama initiated. The article from The Financial Times can be found here. Obviously Exxon Mobil has a vested interest in making money, so their rationale for keeping the US in the agreement is to boost domestic natural gas production to meet our electricity needs. Natural gas is a cleaner fuel source than coal, but not as clean as renewables. In an ideal world, the US would be investing heavily in renewable energy. China is outpacing us in renewable energy growth, Germany has made significant strides to reduce fossil fuel consumption, and Costa Rica set a record for producing 100% of the countries electricity from renewable sources. Other countries have stepped up and become the leaders in renewable energy, while Trump believes coal is the future. We have the capability to transform society towards a renewable future, but not the political willpower to do so. SAD! To understand how society could implement renewable energy across the globe, visit The Solutions Project to gain some insight. Mark Jacobson and his team from Stanford have designed the blueprint for the US and other countries to obtain 100% of their energy needs from renewable sources. These really poor decisions by President Trump and his ardent supporters of the fossil fuel industry remind me of this quote from Carl Sagan about the Celebration of Ignorance. Trump wants to promote the dying coal industry in the face of overwhelming evidence of the effects on the planet, all to help out the fossil fuel industry. This is an excellent New York Times writeup.